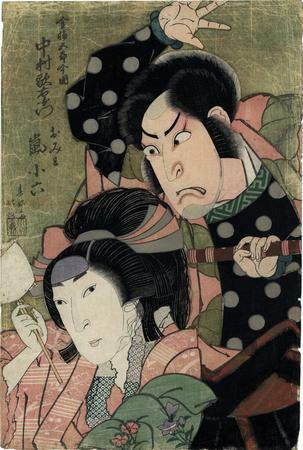 Also illustrated in color in Designed for Pleasure: The World of Edo Japan in Prints and Paintings - 1680-1860 edited by Julia Meech and Jane Oliver, p. 180, 2008. This illustrates a copy from the Mann Collection, Highland Park, Illinois. In this copy the metallic background appears to be browner, but that may simply be the photograph. Or... maybe not. The accompanying text by David Pollack for this entry says: "Prints issued first as limited luxury items, including the use of mica and metallic powders... were followed later by larger and cheaper runs that dispensed with the careful hand-shading (bokashi) of colors that required enormous care and skill by the printer... This sort of retailing resembles today's distinction between hardcover and mass-market paperback-book editions."